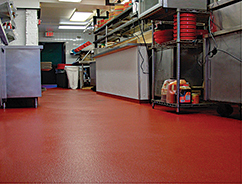 Poly-Crete® color-fast topcoat is formulated to retain its color throughout the life of the floor. By having a coefficient of thermal expansion similar to concrete substrates, the topcoat minimizes risks caused by temperature extremes. It also helps avoid the risk of floor failures typically caused by surface erosion from chemicals, lactic acids, and food-borne bacteria.